My 'homework' while the Online class is on summer break was to send in tatted models and diagrams for 7 vintage edgings from Needleart 1921. All (old & new) are indexed in Bellaonline Tatting Newsletter July 14,2017. So while Georgia continues to enjoy her break (;-P) she has permitted me to share them here. I won't be following the order but stay tuned ‘coz there are some interesting outcomes as each pattern caught my fancy differently ! I like to study a pattern a bit (usually the image or diagram) before starting out. If that row/round has more chains &/or thrown rings, or large rings, then I prefer working it frontside. The same principle was followed here. Started Row I with backside red rings and the blue chains along with the large thrown ring were done frontside. This also enabled me to work the rest of the rows all frontside, since they are only chains & thrown rings. The original tatted model shows prominent picots, which is what I followed and it worked out well. Unfortunately, that vintage pic was taken at a place which has a mistake! Took me a long time of peering closely and studying intently (going back and forth between image, diagram, and text) to figure out and dispel all confusion. In my first sampler above I worked each row separately in an ombre arrangement. But the 3 separate rows can easily be worked continuously without cutting off thread. In order to work all 3 rows in one pass, the sequence of rows has to be changed from that of original. Other minor details and corrections have been included in the new standalone pdf, with corrected pattern and new models & diagram. I have tried to follow the style & format laid out in the article. In this second sampler,in Row I, I added 1ds to the chain on either side on the thrown ring to give it more curvature, as can be seen when the 2 samplers are compared. Also, in order to the blue header, I used a Reverse Join between Rows II & III. However, the same can be effected by doing a lock join, then switching shuttles. Click here to download pattern, with stepwise diagrams and written instructions. I hope to convert this edging into a necklace. Wish me luck and stress-free beadwork. I had to start somewhere sometime! Already much delayed. Instead of putting all 4 shapes in one document as previously stated, I will be releasing them separately. This will give us all time to work. The Quatrefoil Series starts with the smallest medallion, the Triangle - a good, quick way to familiarize oneself with the sequence, general pattern, etc. Size 40 Model – Lizbeth , 2 strands of Anchor embroidery thread. Each side measures 3cm. Size 20 Model – Lizbeth , vintage Anchor Mercer. Each side measures 4cm. Picot length between the split rings plays an important role in keeping the piece flat. The mock picot should be double the size of the inner ring picots. These, in turn, need to be of normal size - err towards small. This will keep the inner circumference small, giving sufficient room for the longer mock picots to span the distance. Instead of mock picots, one can make a small 2/2 split ring. It creates a solid well-defined outline and changes the shape of the inner colour, too. Version 2 worked in size 40 Anchor Mercer. Each side measures 3cm. And please don't hesitate - ask questions or leave suggestions. UPDATE (Aug 2, 2017): Jane is joining the motifs into a hexagon. Below is the pic I had posted here to show one possibility arranging my trials. It can be done in one pass, to be shared ....One path is spiral and easy to work out ... game anybody ? As for the Quatrefoil Magic Square – I am working on it at intervals and it is throwing up some interesting patterns (and difficulties) because of 2 colours. Here’s how far I reached with the triangulation method – I’m sure you must’ve already seen Robin’s excellent tutorials on the same. I could retrace my steps around the pink corner to continue, leading to a much larger piece. But I have cut off the threads for now, in order to work on the simpler sequence of squares. I definitely intend to return to the former, once I can upload more patterns in the series. Here there are 4 squares, creating one complete magic square using the 'easier' pathway of working entire squares rather than triangles. Since I did not think too far ahead, there is a horizontal pink line on the right which can be corrected easily enough. But notice how the inner ecru has created rectangles in this pathway, with a short connection in the center. Also, I have exited in the 'centre' instead of corner and I haven't had time to work further on this. I ran out of pink thread here. Instead of continuing with this piece, I have started yet another, using this pathway, but keeping the pink out of the way. Not enough progress to show. 3 acts of forgetfulness came together for this quick and functional adaptation of a doily into a hair bun (jooda) net. A few days back I realized that I was completely out of hair bun nets and the one I was using already had the frayed elastic knotted for tension. I had forgotten to replenish my stock! 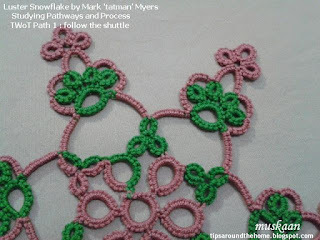 Around the same time, while doing some housecleaning of my tablet files, I came across Linda S Davies’ Split Chain doily pattern saved there - don’t know when/why. These coincidences meant something, right ?! Got right down to it & completed in 3 evenings…. I loved the triangle-type rounds in this doily – such a lovely uncommon effect. And the additional bonus was that I could stop at any round without affecting the pattern. Remember this one in size 40 ? Ahem, it’s still an UFO & may be too small for my purpose. I chose to do this in Anchor size 20, in a neutral colour, for quick completion & immediate use. I've always worn black nets, but the tatting Should be visible - hence colour. Since I wanted a slightly cupped look, I snugged the chains tighter in rounds 2 & 3. Then I eased up a bit on latter rounds, tatting normally. My preference is for nets with smaller spaces. Hence I decreased the stitches in Rounds 5 & 6. Rounds 7 & 8 were tatted exactly as per pattern. Despite peering closely at the process pics accompanying the pattern, I may’ve made a mistake in Rnd 7 chains, resulting in a wavy rather than spiked chain; still, happy with it. The cupping decreased tremendously as the doily grew and lay fairly flat ! Diameter is 7 inches from tip to tip. Instead of encapsulating an elastic band, I left my options open by doing a Lock Chain string with a black wooden bead at either end. But my hair needed the string around the outermost arches. Now that’s a proper net! This was kind of a tentative pilot project in many ways, but it’s success has paved the way for many more. I’ve been collecting patterns for my nets for a while now. Look closely and you will notice an extra half stitch indicated by the arrows. Here I was working chains frontside but using Marie Smith’s method for split chain. In later rounds I used Dora Young’s Knotless technique for the frontside chains. Techniques used : fs/bs tatting (with chains frontside), split ring, split chain - DYK and Marie Smith methods, lock chain, lock join. I enjoyed tatting this up and it’s functionality just makes it that much more special. 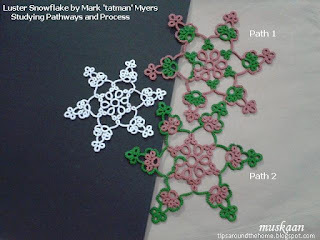 Linda has such amazing patterns on her blog, especially her 3D flowers ! Mission successfully accomplished. Now to complete the UFO net – errr, now where did I keep it? Huh, about that ummm forgetfulness – may be eat more almonds then ?! Been a while since I tatted from the book. These 2 stars were done some months back. It is always good practice to study the round a bit before jumping in to tat. Look for the most convenient elements to start & end with, or in case of multiple rounds, the best element to climb out with. And in case of old/vintage patterns, place(s) where one can substitute techniques for ease of working or for colour placement. I started with a right-side outer ring so that the round would end in a ring (easier to hide threads). And as is so common now, the central ring was worked as a thrown ring from the first chain (with mock picot space). 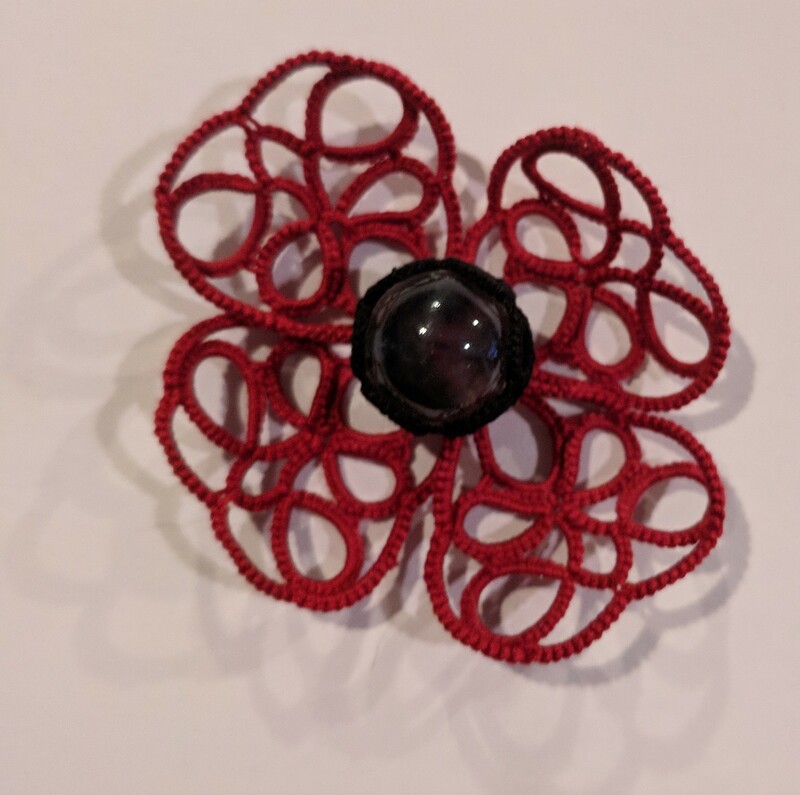 Terms & Techniques : central ring medallion, thrown ring, mock picot, directional tatting. However, I made the joining picots too small causing this huge cupping. Will use it to cover a bauble, egg, or cabochon. The back of an Ice Drop perhaps, or without the central ring, it could well be the front. My first thought was of a basket – tat a handle, add some flowers ! In size 40, it is fairly small. TIP: Cupping v/s Ruffling : cupping occurs when outer round is tight ; ruffling occurs when outer round is loose. To avoid ruffling – increase inner round or decrease outer round. 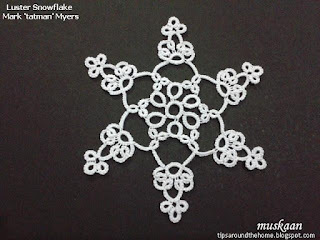 is a very pretty medallion – simple, straightforward pattern. Easy, quick to tat up but need to keep an eye out for which picot to join to. 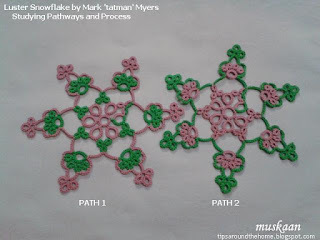 Terms & Techniques : Inward-facing rings, clover, closed space medallion, picot join to the right (last to first join), long chains, directional tatting, avoid gapsosis in clovers. I ran out of blue/green thread on the shuttle. This gives me an opportunity to pick up other shapes and colours, although I plan on keeping the ecru. For all past and future medallions from this book, click on 'BnP' on the Label list. I have also updated (partially) and cleaned up my Jottings page. I don’t post pics of my buys. There’s always so much else to share …. But here are 2 things I’ve been very happy to have bought – it is their Product Design that I’d like to talk about. Placed alongside a Pony shuttle for size comparison. 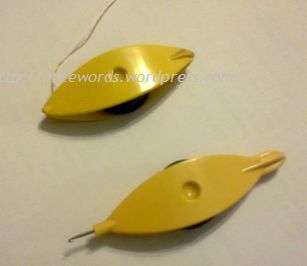 I recently saw this needle threader in my old craft shop (it’s been 4 years since I stepped into that shop!). I liked the unusual shape & instantly bought 4 – one in each available colour. A very happy & useful buy in more ways than one !!! The hook at the end is ideal for size 30 & finer threads. It works for size 20 and 10 too but one has to be careful to hook the thread completely before pulling through. The shaft is flat. So inserting into the tiniest or thinnest needle hole is pretty easy. But an additional advantage I realized was that it could act as a beader too !!!! I’ve been using it since to load beads onto a picot, with great results. The black lace in above pic is Anchor size 20 (almost double the thickness of Lizbeth 20) & this threader was used for the blue & green beads. The old-style threaders are of no use when it comes to loading beads on a picot (my preferred method - LBP without beads), and crochet hooks may cause a mismatch between thread & bead size. You might remember this bead box from an earlier post. Bought it on Amazon.in . It has a rotating lid with a triangular opening that stays on the white part when not in use; thus locking the beads in their respective compartments. Rotate to the colour one wants and work with the beads. Or tilt to remove those beads on to a tray – the others stay in their place. Once locked into default position, the box can be upended without fear! And it is so portable (see 1st pic for size comparison) and reuseable ! Earlier I had bought transparent beads for their elegance. But they don’t photograph well ;-P Hence opted for these opaque ones. Product design and practicality matters just as much as the pattern design. Increase the fun & comfort quotient with the right tools ! off to The Pentagon ! I totally forgot to post the pentagon trials in my previous post! These were accomplished before I started on the triangles. I realize you may be getting bored seeing the same stuff in the same colours. However, I think it goes fairly well with the ecru. I’ve made 5 of these with slight tweaks in stitch count. Arranged in a semi-circle they make a lovely collar. Or continue around to complete the circle fore a lacy edging. The size 20 one is ready, so that's what matters. I've found that size of picots makes a difference in these shapes lying flat. The placement of joining picots in inner rings also makes a difference. 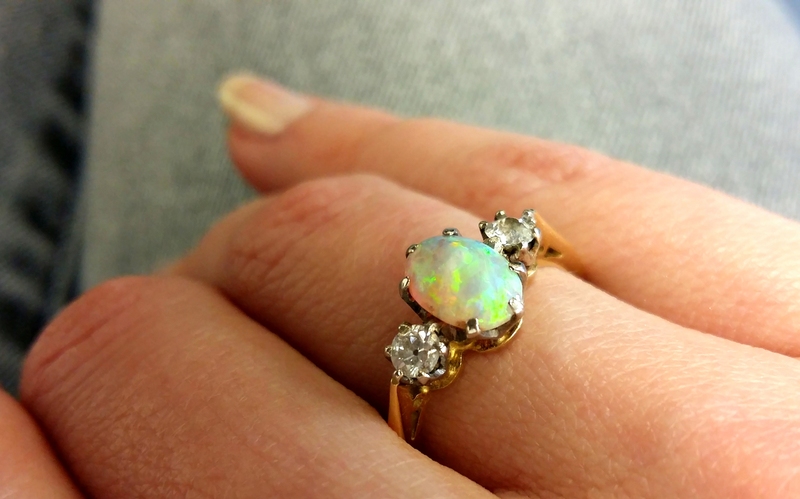 And where the ring is split causes the shape to widen/spread out or remain closely packed. Fun to experiment with these factors, especially since all rings are 24ds each. And working it in 2 colours adds to the fun factor. With Wimbledon over, I’ll be able to get back into this pattern-writing and diagramming stuff more seriously & diligently now. I’m thinking of sharing all 4 shapes in one pdf. Next I’ll do the bookmark in a separate pdf. After that I hope to tat these one-pass magic shapes and share as I go. And I promise to use different colours, but in size 40 - it's the size I enjoy working with. I’ve added ‘quatrefoil’ to the Labels’ list on the right panel. Click or use the search engine to scroll through my previous posts. tatting in my pocket ! It was on e-tatters, and it grew for quite a while, with more and more people adding verses. Maybe we can add some more verses? The only rule is, the third line must include "tatting in my pocket". Is always very refreshing ! I won't just stop at a Cluny ! One often hears this talk. To unlock with a Block ! Is creating shapes from a Quatrefoil ! Will make lace for miles and miles ! Four shapes derived from the initial design hack ! Tatted in size 40. I’ve now tatted all 4 shapes in size 20 to determine picot size before I present the final pattern. Will share those pics with the pattern. These are the various Quatrefoil Triangle trials. I was too lazy to block them for a proper pic, but these generally lay flat. Retrieved #4-6 from the hexagonal scrapyard – sewn in layers, added a bead, etc. I didn’t spend time shaping or curling the ‘petals’. Noticed the 3 leaf rings enclosing the stem ? Kinda cute, no ? I'm going to use this in future! let there always be tatting in your pocket ! 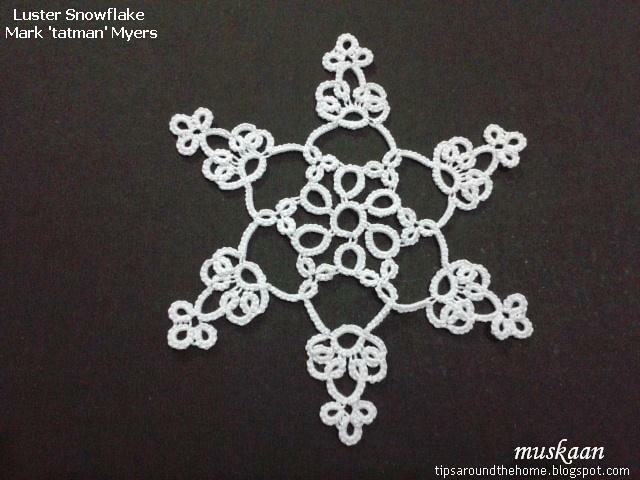 Luster snowflake by Mark Myer is an excellent study in tatting continuously without cutting the thread, using techniques such as split rings (SR) and self closing mock rings (SCMR) to climb out. The pattern also provides plenty of SCMR practice. We’ve all been there – we can do the split rings and SCMRs, yet the orientation and which shuttle goes where can get confusing during early stages of learning. Which is what happened with Amritha from the online class. She is aggressively learning many tatting techniques and often emails me for help. I can usually answer her questions using various means, but this particular one needed a holistic approach. It required more stepwise visuals, despite the accompanying diagram and notations therein. And I discovered 2 pathways in the process! With Mark Myer’s kind permission and lovely email, I am sharing the path/sequence of elements in the snowflake, through the use of 2 different colours, in the hope that others facing similar situations may also find some resolution. 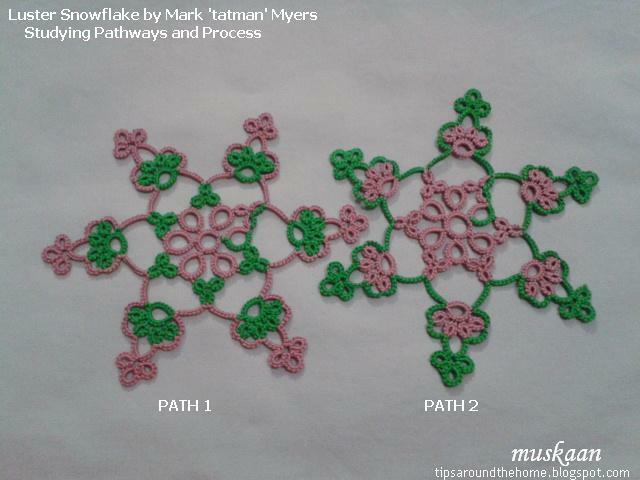 This exercise will be beneficial in future 2-colour tatting to understand placement of colours, direction of tatting, shuttle choice, and directional (frontside/backside) tatting - to make choices and understand effects. This project was started & completed in May when his Tatterville site was still operational. Since then, most of his patterns have been shifted to facebook. This pattern can be downloaded from Photos → Tatting Patterns album. The stepwise pics and explanation are in the pdf along with notes, tutorial links, table and tips such as when to switch shuttles, etc. When you climb out with a split ring and the very next element is a chain, how do you work this ? Do you reverse work and tat the chain from the back side (path 2) or do you simply switch shuttles and continue from the front side (path 1) ? My own feeling is that the former is almost a natural subconscious movement and often unwritten/unspecified in written patterns & diagrams. The switch shuttles is a more ‘modern’ phenomenon. And I guess tatman used the Reverse Work path - it all fits in. I faced a somewhat similar directional dilemma in this heart pattern where the diagram & instructions went a certain way & my tatting the other. 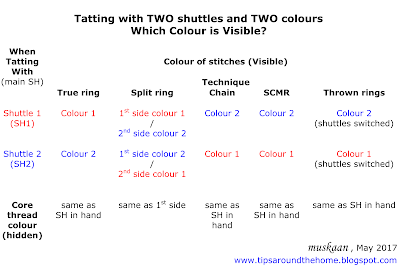 Your choice determines the overall direction of working the round, the shuttle required for elements such as thrown rings & SCMRs, and also the colour of chains, thrown rings, mock rings in two-colour tatting. This is one of the TWoT (This Way or Tat?) rules that is yet to be shared through diagrams. In both models, shuttle 1 has copper thread and shuttle 2 has green. The center is worked exactly the same. Only after the climbing into outer round with split ring, do we need to take a decision on how to proceed. Path 1 involves choosing the nearest shuttle . Thus tatting progresses from the front, in a clockwise direction. Compare also the colour changes that occur in the outer round because of these choices - in the chains, the rings and the thrown clover! And obviously the working shuttle changes. So how do we decide which shuttle produces what effect in some of the common techniques used ? Especially in 2-colour tatting. The following table works as a quick reference. 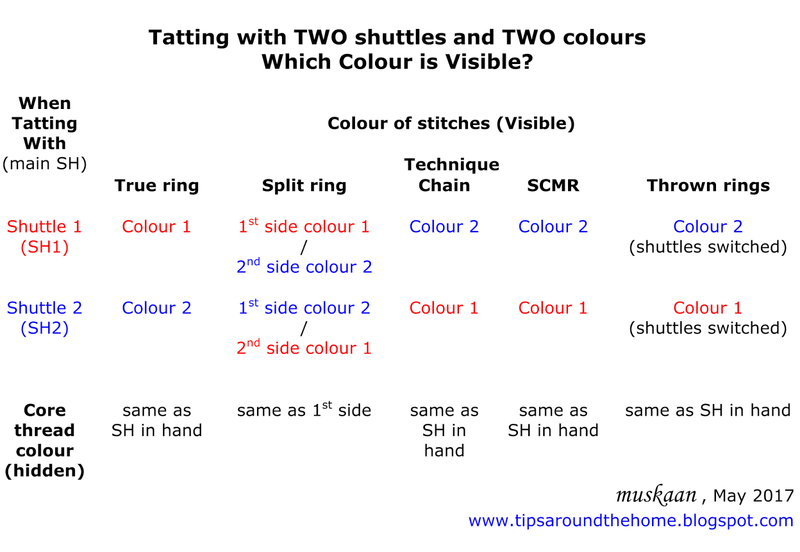 Red thread in shuttle 1 & blue thread in shuttle 2. The table shows the colour of stitches and the lower row shows core thread colour (which is the same as the working shuttle, except in case of split rings). I thoroughly enjoyed tatting the 3 models, although I do prefer working in size 40 (white). And I hope some confusion will be laid to rest through the pictorial in pdf. This is my first tatman pattern, but definitely not the last. 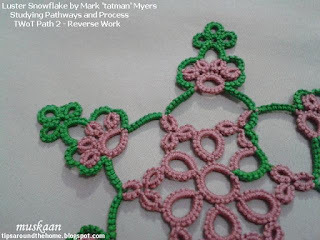 a Mexican wave of tatting ! Different time zones can be quite limiting in many ways. Or they can create a Mexican wave ! While some sleep, others are awake to carry on tatting and the wave goes around unending. My volunteers eagerly raised their shuttles (to my call for help) and worked as a tatting-wave and they deserve a similar ovation. My 5 test tatters are from 4 different continents !!! Through the day I kept getting progress reports, pics, & feedback. Oh, it is so exciting to be a part of this wave. In less than 24 hours of sending out the pattern, I had my answers! I feel so blessed to be surrounded by such a community. Now it's my turn to finalise the presentation and tat a new error-free bookmark. It lays flat but the rings need to be worked carefully - some have a tendency to get squished. I found the hexagon that wanted to be a square. Instead of a mock picot it has a tiny 4ds split ring (SR) between the 2 SRs. I like the pattern it creates and a fabric of these squares would definitely be much more interesting in 2 colours. Both versions together for comparison - the inner square is more defined in 2nd version. So, back to the hexagon. I did another one without picot space between split rings. Kind of squishes the SRs, don't you think ?! Space between the 2 SRs provide some flexibility. Jenny did something interesting - instead of a mock picot with equal thread lengths, she allowed the upper one to be longer, and the lower one to remain flush. It worked for her !!! A single colour CTM version causes the sequence and direction of work to change ! I placed the 4 individual medallions I had and it works on this rings only pattern ! Can it translate to a rings & chains pattern is something that needs to be seen. as half hexagons in a kind of undulating wave. Very early days though. Need to work on it some more - what will happen if another round is added? A one-pass rectangle made of these hexagons is easy to figure out. And the Magic Wave continues across continents with Jane sharing her own experiments - do check out her recent posts on the topic ! How about a Global Tatting Mexican Wave ? Start from the East and follow the sun till it sets in the West, with tatters working on a butterfly or heart or any small motif and then uploading a pic immediately on any social media they follow. I remember something similar was tried a few years back. Did you participate? tatters are magicians who create enduring lacy waves !